These wicketed ice bags are perfect for automatic and semi-automatic Ice Bagging Machines. These wholesale wicketed ice bags are pre-printed "Pure Ice" and mounted on a wire wicket header with an open top. Each wicket comes with Plastic Twist Ties to close the Crystal Clear ice bags securely. Preprinted wicketed ice bags are in-stock and ready to deliver immediately. They are made with virgin resins, which are FDA and USDA approved for contact with food. EVA has been added to these bags to increase their strength, puncture resistance, all the while reducing brittleness at ice cold temperatures of -20º F. Wire wicketed ice bags. Twist Ties are included. Each wicket contains 250 bags. • Wire Wicket Bags work with many semi-automatic bagers. 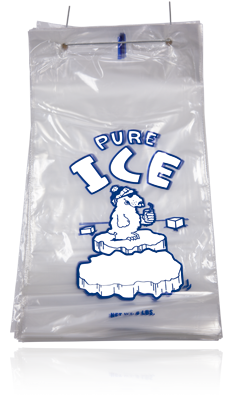 • Plastic Wicket Bags are for use with our Easy Ice Bagger dispenser system. Need a Custom Quote for a Custom Printed Plastic Ice Bag On a Wicket? Wicket of Ice Bags - bags to put ice in that comes out of commerical ice maker - follett DB650 ice bags - Follett DB1000SA Ice Bags - ice machine bags - wicket ice bags - ice bags for ice machine.